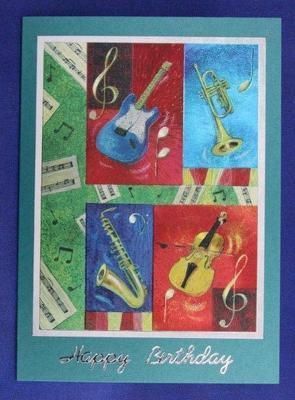 A pearlised emerald green 126 x 178mm card displaying musical instruments of guitar, trumpet, saxophone and violin decorated with musical notation. The images are foiled and have an engraved finish which is really difficult to photograph! 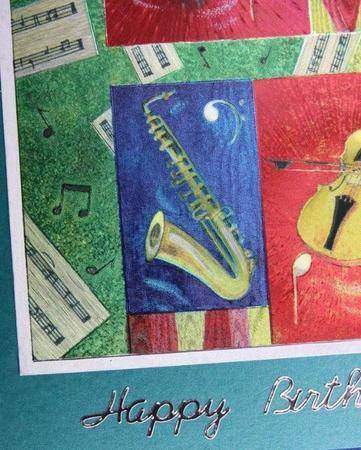 The wording shown is Happy Birthday but this can be changed to suit your requirements, as can the paper insert which reads Wishing You a very Happy Birthday. Please use the form below for alternatives.